Here we are again! 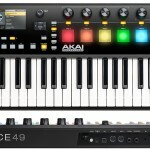 An exciting new MIDI keyboard controller from of our favorite creators, Akai Professional. But what a second…doesn’t it look a lot like those guy’s keyboards over at Native Instruments? Yes, yes it does. However, don’t get judgmental too quickly. It’s quite obvious they’ve taken a liking to the aesthetics of NI’s Kontrol S-Series keyboards; but we’ll take that as merely complimenting them. It doesn’t look like the features list is quite the same, and these are a little more affordable than the S-Series, but not by much. 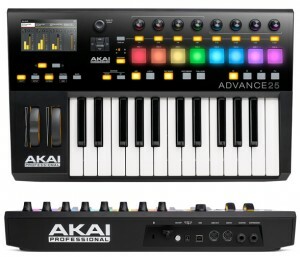 Let’s take a look at what Akai has given us this time around with the Advance 25 MIDI Keyboard Controller. We know what you’re thinking. As soon as a new MIDI controller is out, the price is one of the most important specs to consider. 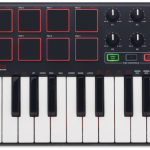 Well, these are around the same price-point as the new Kontrol S-Series keyboards by Native Instruments. In fact, upon first announcement by Akai, our immediate thoughts were on the aesthetics — quite similar to each other don’t you think? Not that that is necessarily a bad thing, but it looks like NI has caught Akai’s attention here. This 25-key model has a bit smaller pads and knobs as compared to the 49 and 61-key models — it isn’t necessarily a ‘mini’ model, but does come with these smaller features, so it’s perfect if you want a more compact solution to add to your studio. If you do grab one, just know it can ultimately act as a standalone MIDI controller, so it’s not completely dependent on the new VIP software. All knobs, buttons and pads are fully assignable to whatever you like. The pitch and mod wheels work as intended. It will work with most major digital audio workstations, in fact it has a preset for most of the popular DAWs. Besides that, it’s mostly a standard MIDI keyboard controller. However, that isn’t what is justifying their price point and overall attraction to this model. It’s all in the software. Continue reading. We’re always big skeptics when it comes to MIDI keyboard’s keybed. 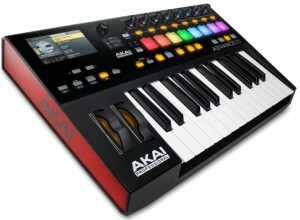 Akai has been pretty much at the top of the list when it comes to key makes (as they should, considering they’re typically one of the higher priced). No, they haven’t done much with the keys in comparison to the MPKII series they a year ago. However, this isn’t anywhere near a bad thing. They’re semi-weighted and velocity-sensitive, and if you were wondering, they indeed have aftertouch. There’s always a debate here — many key players swear by fully-weighted; but with MIDI controllers the safest bet is typically semi-weighted. The verdict is: in a side by side comparison, the Advance keyboards and MPKII series have the same keybed. We’re quite happy with the key make, which wasn’t really a surprise with Akai. If you want a fully weighted keybed that emulates a real piano, we recommend checking out our best digital pianos article and grab one with MIDI capability (they’re pretty expensive, mind you). As always, Akai brings us a solid build, avoiding the cheap plastic and dinky material (won’t name any brands in particular…). The knobs are easy to work with, the buttons work as intended, and the drum pads are great because…well…they’re made by Akai. Not necessarily an MPC drum machine kind of pad entirely, but it gets the job done. We had no problems when pressing them at the trade show and having the sensitivity sound natural (there have been complaints about this in their original MPK keyboards). Great job here, Akai. Although when it comes to the build comparison vs. the MPKII keyboards, it isn’t as tank-like (for lack of a better word? ), but is still very solid. 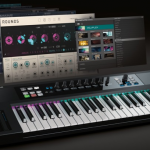 So one of the biggest standouts of this keyboard, and perhaps a price justification, is their Virtual Instrument Player (they call it VIP) software that’s included. You can load it up with or without your DAW running. 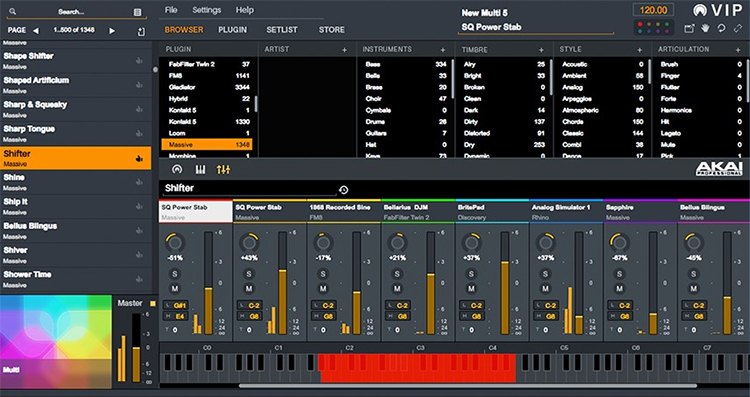 With this, you can basically navigate through your VST’s pretty flawlessly and without having to use your computer at all besides a unit to load up your library. It’s especially great for those performing live; I’ve heard many fuss about being organized and lack a rhythm when it comes to planning out their sets in the DAW itself. It usually takes a lot of practice (I second this), but with VIP it’s basically made to cut those corners and is tailored to those of us who do this. If you don’t plan on using the VIP software, we recommend buying an MPKII keyboard instead. With VIP, you can also create some key zone splits and mappings. It’ll work with those in the studio as well. It’s not just limited for live play since it’s compatible with any DAW. When comparing it to Maschine, it’s a bit easier to bring up plug-ins. The workflow is relatively rhythmic, and although it takes a little while to learn it, it’s pretty easy to use out-of-the-box. You can save presets inside, which is a huge plus for convenience and workflow. We’ll review the VIP software in it’s entirety when we get a chance to use it for more than 10 minutes. All in all, we’re pretty impressed with these keyboards. 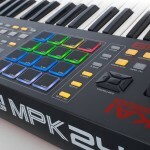 We want our readers to keep in mind that the MPK225 keyboard is still a viable option if you want to save some money. If you already have one, we wouldn’t say we recommend an entirely new upgrade with an Advance 25. The only reason we would say so is if you’re highly dependent on VST and plug-in control and perform live. The sounds that come along with the Advance may also attract you as well (yes, 16 gigabytes! ), although they’re not too ground-breaking in terms of being worth it alone (we didn’t hear every single sound, however, and it doesn’t come near NI’s VST’s). Better yet, if you do already have Kontakt, VIP will work inside of it. Also know that the VIP software will not be sold separately as of now, and this has caused quite the stir in the Akai fan community. The MPC Software Users group on Facbeook even started a petition. Many are complaining since they’ve just purchased an MPKII keyboard. But that isn’t the point; this MIDI keyboard is specifically made for controlling the software. And if they did make it readily available, people could use the software with other brand’s controllers which would be a pretty dumb marketing move. 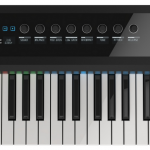 You can even check out the Native Instruments Kontrol S25 for a solid competitor, although it’s a tad bit more expensive but actually comes with quite a few more features (you’ll need their NI software called ‘Kontakt’ to use it to it’s fullest potential, which will cost you even more money if you don’t already have it. Just keep that in mind). Read our review if you want to compare it some more. 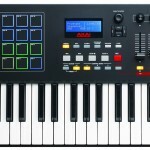 Regardless of all of the comparisons, grab an Akai Advance 25 MIDI keyboard if the above pertains to you. It’s not like you’ll be disappointed, and if you have the cash, it will be a solid investment that will last you for many years if you take care it. It’s a MIDI controller in it’s rawest form, although if you’ll be using the VIP software is one of the biggest deciding factors if you’re comparing this to other popular MIDI controller models in the market. 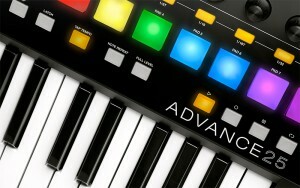 Or if you want a key count up, check out our Advance 49 MIDI keyboard review.